Wanda Pratt is an NBA mom. 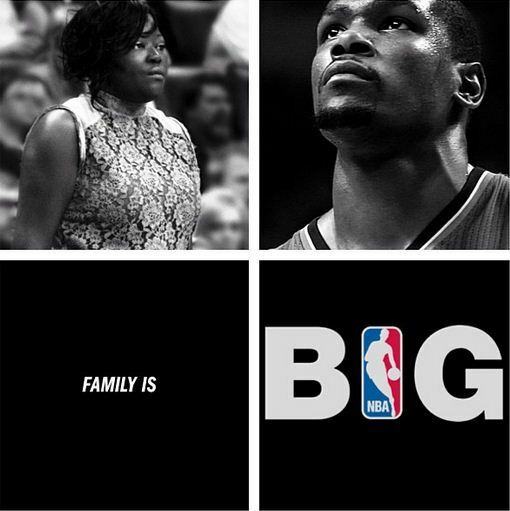 Kevin Durant is her son. Looking for her? She can be found in her court side seats during every Oklahoma City Thunder home game at Chesapeake Energy Arena. The NBA thought she and Kevin should be included in the “Big shots” element of its ongoing “Big” campaign, so they made a commercial which demonstrates just how dedicated she is to her craft — supporting Kevin as his number one fan. Ms. Wanda is a force to be reckoned with. She once took on Stephen A. Smith and Skip Bayless on ESPN First Take with quiet aplomb. Look for other NBA Big spots featuring Kobe Bryant and LeBron James, soon.